The Edinburgh Directory began, and will always be, a free-of-charge directory with access to all businesses and organisations who meet our basic criteria. For such standard listings we'll display your postal address, telephone number, fax number, a link to a map of your location (based on postcode) and your web site (optional) - all free of charge. Entry accessible from all other Directories in the Scottish Directory Group. 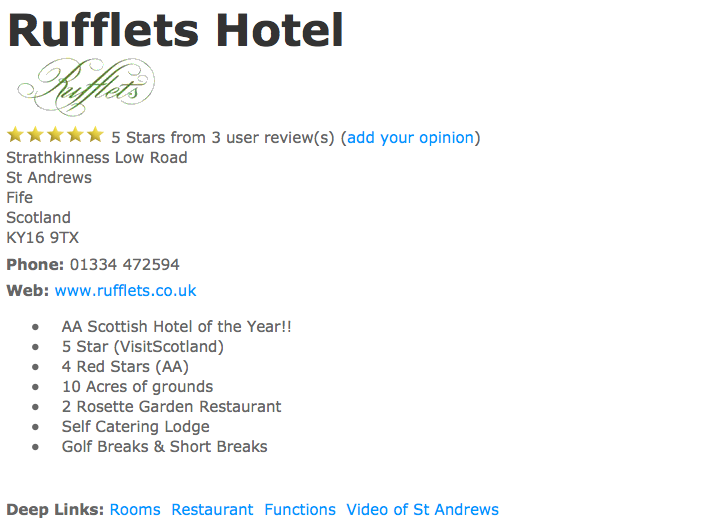 Here's an example from the St Andrews Directory for Rufflets Hotel. If you'd like to know more about listing options, please contact our Webmaster.